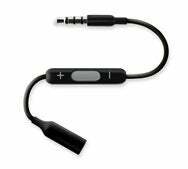 Belkin has announced its new Headphone Adapter for iPod shuffle, a $20 adapter for the third-generation iPod shuffle that lets you use any headphones while controlling the shuffle's playback functions. Just like with the Apple-supplied headphones, the in-line adapter lets you control play/pause with a single-click; jump to the next track with a double-click or to the previous track with a triple-click; hear the title and artist of the song playing (the VoiceOver feature) by pressing and holding the multifunction button; and move between playlists by pressing and holding, and then releasing, the multifunction button after you hear a tone (you click to select a playlist). The adapter will be available in North America at the end of July, and in Europe, Asia, and Australia in mid-August.